It’s very often that I ask Kevin what we should make for dinner. It’s extremely rare, however, when he actually answers me. So, when he does, it’s sort of a done deal. Last week, our friend Seth was in town for a couple days for business and we had him for dinner one of the nights. 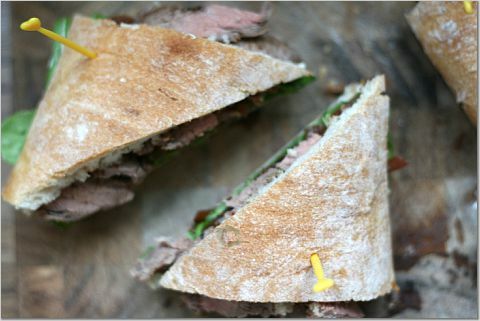 Almost without hesitation, when I asked Kevin what we should make, he responded: “Mmmmm, those steak sandwiches.” Done. It was a perfect choice. 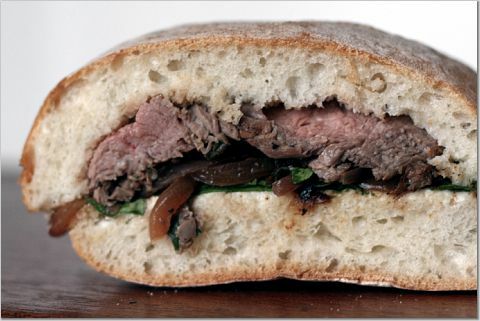 For one, the sandwiches are delicious: simple but bold flavors, resplendent with the textures of crunchy grilled ciabatta, languid sauteed onions, lush blue cheese and flank steak, with its dense chew. Plus, the sandwiches are really easy—thanks in large part to the fact that you only need to make one big sandwich (which you slice into individual servings) rather than a bunch of small ones. There was one problem though, and I didn’t realize it until I was topping the sandwich. I made these sandwiches the last time Seth was at our house, for a BBQ we threw a couple nights before our wedding last August. As Seth and Kevin hungrily eyed the juicy slices of flank steak, they didn’t seem to grasp the magnitude of this oversight. I only get to see the guy a few times a year and I made him The Same Thing Twice in a Row. Appalling, really. At least it was all Kevin’s fault. Graciously, Seth agreed to forgive us both and we all enjoyed the sandwiches. Again. Salt and pepper both sides of the flank steak and place it in a large Ziploc bag. In a small bowl, whisk the soy, mustard, 1 tablespoon of olive oil and all but 1 teaspoon of the lemon juice. Pour the marinade over the steak in the bag. Refrigerate for 30 minutes, turning once. 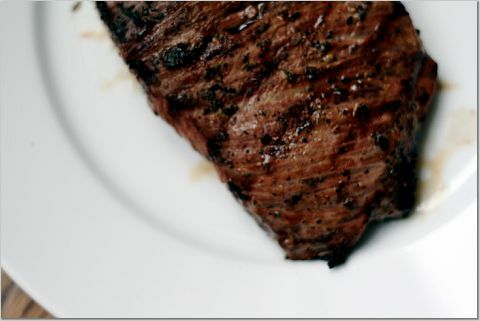 While the steak marinates, heat the remaining 1 tablespoon of olive oil in a skillet over medium heat. 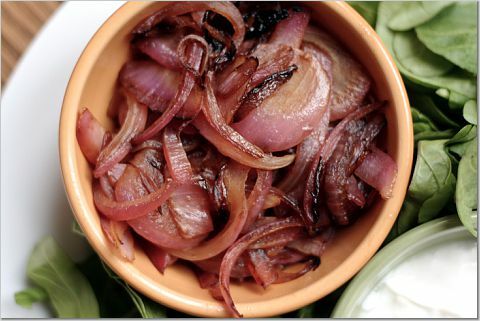 Add the red onion slices and cook for several minutes. Add the red wine vinegar and cook for an additional few minutes, until the onion is very tender. Set aside. Prepare a grill. 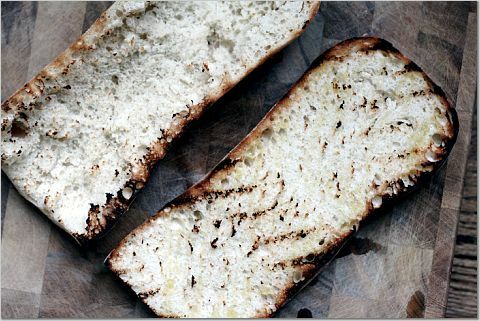 Lightly brush both cut sides of the ciabatta with olive oil. Grill the bread, cut sides down, for 5 to 7 minutes, until the bread is slightly charred. Meanwhile, remove the steak from the Ziploc, discarding the marinade, and grill for 5 minutes per side. Remove the steak to a plate and cover with aluminum foil. Allow the steak to rest for at least 5 minutes. 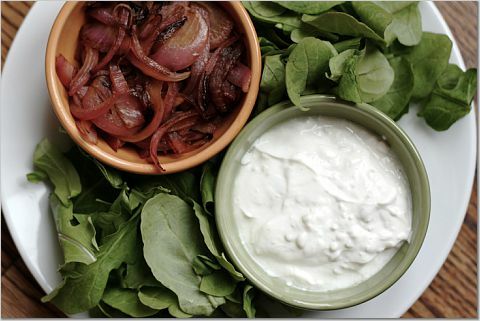 While the steak rests, prepare the blue cheese spread by combining the yogurt, blue cheese and remaining 1 teaspoon of lemon juice. Salt to taste. Slather the blue cheese mixture onto the cut sides of the ciabatta. 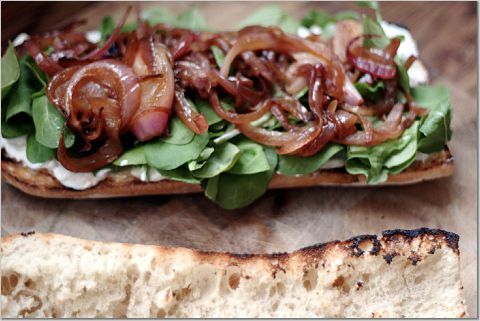 Top one half of the ciabatta with the arugula and sauteed onions. Slice the flank steak thinly, across the grain. Arrange the sliced steak atop the arugula and onions. Top with the remaining ciabatta half. Cut in thin fingers or triangles to serve. Wow. We just bought a grill, and this is going to the top of the list. These were delicious. Thanks for having me over. Emily: Congrats on the grill! I think of you (and the crew) everytime we use ours. Also, do you miss Bermuda as much as I do? Seth: Any time! I only wish you were closer so we could do it more often. Kari: So glad to hear that someone shares my paranoia! Ali: I’m baaaack. And I’ll cook for you tomorrow if you want! This is my idea of a perfect sandwich! I can’t wait to make one. This is the recipe I’ve been looking for. 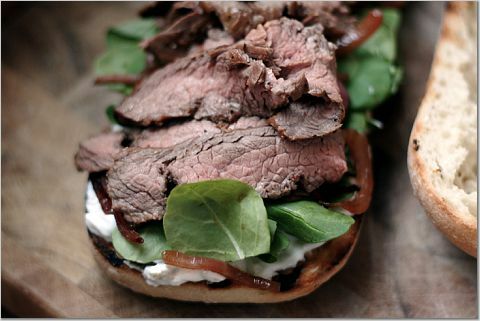 I am huge fan of beef, and I love the combination of the steak with the tanginess of the bleu cheese. I have yet to find a recipe for the perfect steak sandwich, but I think this will do the trick. Thanks!